HIS BACK PAGES: Elbert Howard in his home with the paper he started as founding editor. Instead of proudly carrying a legacy that changed the face of social activism forever, Elbert Howard kept it a secret for nearly 30 years. If one were to have visited Howard during the 1990s, where he lived a fairly anonymous life in Tennessee, it would be almost impossible to imagine the gunshots, the riots, the espionage, the planning and the sacrifices that provided the backdrop to his previous life in California. In fact, it was only long after he left the activist front, at his group's 35th anniversary in Washington, D.C., that Howard's own daughter discovered who her father had been and what his legacy meant. 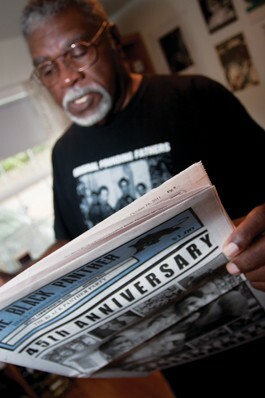 "Elbert "Big Man" Howard is one of only three surviving founding members of the Black Panther Party." He edited their newspaper, instituted many of their programs and traveled overseas as a spokesman. Today, in his modest Forestville home nestled between a corner market and a shady country highway, Howard may appear to live the quiet life. But the panther, as it were, is still prowling. Slowly but surely, Howard has made his large presence known since moving here in 2005. "Howard is a co-founder of the Police Accountability Clinic and Helpline Sonoma County (PACH), a community organization that offers a resource for fighting police brutality by keeping records of incidents-police reports, autopsies-and providing assistance." "On Guerneville's KGGV-FM, he hosts a weekly radio show that, deemed a tool for "jazz music education" by Howard himself, spans the history of jazz from early Louis Armstrong to modern avant-garde musicians." In 2001, Howard self-published his memoir, Panther on the Prowl, recounting the quiet rise and booming fall of the Black Panthers while simultaneously making a case for the continuation of social activism. "After the party broke up, a lot of people were lost," begins Howard, sitting in his kitchen, behind large prescription glasses. "And I wasn't gonna be one of 'em." He explains that writing his book served as therapy which helped him understand and accept the tumultuous and often frightening events that took hold of the United States and eventually the world in the 1960s. Growing up in Chattanooga, Tenn., Howard lived a childhood relatively free from the perils of racism, due to Chattanooga's thriving black community. Though he was always aware of inequality—his book gives an unnervingly detached account of his neighborhood's interaction with the KKK—it wasn't until he joined the Air Force in 1956 that he felt the gravity of the situation. One of his first personal encounters with prejudice came when, in the process of passing the time and bonding with another white enlistee, Howard was denied entrance into a segregated cinema. "The military was a way to expand my horizons," Howard smiles. "And Chattanooga was a road to nowhere. We had the opportunity from our base in Vermont to travel to Canada. There, of course, I met people much different than myself. I learned that there were black people in Canada that weren't from the United States. That was an eye-opening experience. [Black] people seemed to be accepted there," he recollects. "Just in everyday interactions with people, it was a lot different. There wasn't that unstated tension that one feels in America." After more than four years of service, Howard was fatefully and conveniently discharged near Oakland, where cultural acceptance and personal enlightenment were liberties reserved for an elite few. Oakland in the 1960s was a foggy city of heavy industry, punctuated by social chaos. With a large black population living in close quarters to an even larger white population, racial tensions ran high. The Oakland Police Department involved itself constantly in such tensions, and, not surprisingly, black citizens were routinely shot by officers. The killings, Howard recounts, were almost always deemed justified by the district attorney. Howard, beginning his studies in political science, observed and sometimes participated in meetings of an African nationalist group at Merritt College. Through this involvement, Howard befriended two fellow students, Huey Newton and Bobby Seale, and the three would casually get together for political discussions. "I like to think that I didn't choose the Black Panther Party, the Black Panther Party chose me," Howard philosophizes. Political discussion developed into political action, and Howard inevitably became the third member of the Black Panther Party. One of the party's priorities was to respond to the police department's racial injustice and abuse. "The police patrolled, not to protect our property—we didn't have any," Howard explains. "It was to control and dominate us. We saw someone killed by the police almost on a weekly basis. We saw that the power they had over us grew out of the barrels of those guns, and we surmised that one way to deal with that was to arm ourselves." With that, the Black Panthers envisioned one of the first incarnations of a police checking system. The party's safety patrols employed law students to monitor police activity throughout the night and to be present during many arrests, advising and aiding potential victims of racism from a legal standpoint. According to Howard, the police never brutalized their offenders in the presence of the Black Panthers. By phone, Black Panther cofounder Bobby Seale reports that Howard played an important role in the safety patrol program, and was responsible for teaching the Panthers how to use their weapons for defense. "Elbert and I, we were ex-military. Being ex-military, we were able to show other party members the use of guns and weapons, and the safety of weapons," Seale says. "There were only three: myself, Richard Aoki and 'Big Man' Elbert Howard. To me, as chairman of the Black Panther Party, Elbert Howard's experience was invaluable. We taught all the other party members. We taught Huey Newton what guns were about, how to really break the weapons down." As the Black Panthers grew in numbers, their programs grew in depth. Howard himself was responsible for a free medical clinic for sickle-cell anemia and a work-study program for parolees at the college. The Black Panthers also created a free-breakfast program, piqued by poor children's inability to succeed in school due to malnourishment. This latter operation, Howard explains with a sardonic chuckle, has actually been the unstated model for generations of government-run breakfast programs. "We needed to address the community," Howard says. "We wanted complete change. Social revolution, put simply. We knew it was gonna be a community to do that, not the Black Panthers." In such efforts to appeal to the community and voice their cause, the Black Panthers decided to found a weekly newspaper—and looked for an editor. "I was led by the youthful willingness to do whatever it takes to get a job done," Howard reflects. "I said, 'I don't know anything about it, but I will find out.'" With that, Howard became the first editor of The Black Panther. The efforts worked. The Black Panther cause rang throughout America and into Japan, where Howard, as the international spokesman for the Black Panthers, was invited to speak. Howard found that in Japan, numerous protest groups competed for his exclusive participation. Such competition was in contrast to the Black Panthers' belief in forming solidarity. According to Howard, it was counterproductive to spend time arguing about which philosophy was best. Yet the trend of pitting activists against each other did indeed become a technique that the Black Panthers' adversaries adopted in order to break down the party's solidarity and organization. When Howard returned to the United States, FBI and CIA agents were pitting West Coast and East Coast Panthers against each other through spies and misinformation, resulting in the murders of men on both sides and the incarceration of many Panthers, including Howard himself. Howard can't remember how many times he was thrown in jail. One day, he and some fellow Black Panthers were sent to New York. When they were picked up from the airport, Howard says, their "driver" drove in circles for hours and eventually dropped his passengers off—directly into jail. Yet the Black Panthers remained diligent. Seale himself recalls that even when in jail for long stretches of time, there were still plans to be made and directives to be given. Seale attests that no matter where he was incarcerated, Howard would always travel to visit in these moments of crisis. "Oh yeah, he was always there," Seale states. "I could always count on Elbert and my brother John Seale to get information out and tell other party members." After Howard left California in 1974, he involved himself in private industry and took a retail position back in Tennessee. Yet the FBI still kept an eye on him and even traveled to his workplace to check up on him. All through this, did Howard ever feel defeated? "I never felt that," Howard responds, somewhat indignant at the question. "I was always determined to push our programs forward." Howard continues. "I was most optimistic when we began to get responses from the black community. Not only in Oakland but around the country," he says. "A prime example was when I was sitting in the central headquarters in West Oakland, and I got a phone call from some lady in the community, upset, saying, 'My husband is cussing me out, he's abusive and angry. Can you guys send somebody out to see about that?' Then I saw that the community, rather than calling the police, called the Black Panther Party." In the early 2000s, Howard was diagnosed with prostate cancer and returned to California for treatment. Yet despite his current health setbacks and location in a less-than-bustling city, his momentum for activism seems to be carrying on. Having settled in Forestville with his wife Carol, Howard founded the Police Accountability Clinic and Helpline. Motivated by the series of shootings that took place nearly a decade ago in Rohnert Park, and with his roots in the Black Panthers safety patrols, he began offering workshops to citizens for dealing with police abuse. "Such workshops eventually developed into PACH, which takes complaints from victims and organizes comprehensive reports." Over 40 people have been killed by law enforcement or have died in custody in Sonoma County since 2000, and that statistic, Howard says, represents an ongoing problem. "Up here, there's a small community of African Americans but a vast community of Latinos, and they face not only police brutality and imprisonment but deportation for immigration issues. There's a massive number of young people here who have to face the issue of whether they'll come home from school and find their parents are missing and then come to find out they've been deported. Those are real, current issues." Howard even views his jazz radio show as a form of activism. "I try to really enlighten young people about the history of this music. Especially those hip-hop and rap aficionados, to let them know that that music didn't just drop out of the sky. It goes back to gospel, to the field songs of slaves. It's progression, it all has a connection," he explains. Despite a hesitancy to involve his immediate family in activism, Howard firmly believes that the possibility for a brighter future rests on the youth's shoulders. His advice for them is timeless, and built on direct experience. "Organize. Put heads together, talk about and analyze issues. You might start with one or two or three people. It doesn't have to be a large group. You can take five people, and once you get a good solid idea, those five people can talk to five more people. Take some action—action speaks louder than words. It is very easy to join an organization, and it's tough to create an organization. But not impossible." Photos of the early days of the Black Panther Party are on display at 'Black Power—Flower Power,' a photography exhibit by Pirkle Jones and Ruth-Marion Baruch running through Aug. 30 at the Marin Community Foundation, 5 Hamilton Landing, Suite 200, Novato. 415.666.2442. The Police Accountability Clinic and Helpline is at www.pachline.org or 707.542.7224. The Big Man's Jazz Show is on 95.1 KGGV-FM on Saturdays, 8-10pm.